Comments by others to this web-page 8. Toronto Star - Jan. 28, 2009 - By Mike Funston, Long term staff reporter. 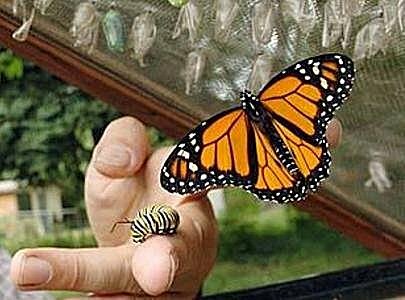 raises monarch butterflies in his Port Credit backyard. Don Barber is the monarch man of Mississauga. 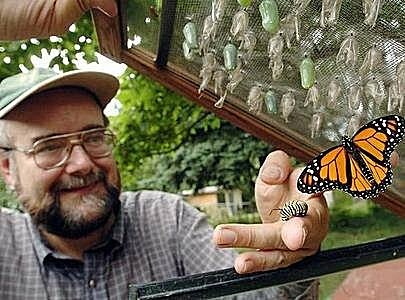 Barber has turned a patch of garden in his Port Credit backyard into a monarch butterfly breeding ground that last summer produced almost 500 additions to the black and orange species known for its annual winter migration to Mexico. A man with a passion for environmental causes, Barber was looking for a simple and inexpensive way to help out nature at home. He started five years ago by collecting milkweed from a nearby field and planting it in his garden. Monarchs lay their eggs on milkweed leaves, which the hatching caterpillars devour. Barber keeps an eye on the milkweed all summer and collects the leaves when he sees eggs on them. They are put in an aquarium indoors. The caterpillars hatch in a few days, and after feeding for two weeks spin a chrysalis, hanging upside down from the aquarium lid. About two weeks later, the butterflies emerge and Barber sets them free, often inviting neighbours over to enjoy the experience. "It's something that makes me very happy and makes the neighbours happy, too," Barber said. It's an ideal project for kids during the summer, he says. "It's simple, inexpensive and anyone can do it." Even raising three or four butterflies is a contribution, he said, noting that monarch habitat is being destroyed by logging in their forested wintering grounds in Mexico. Hats Off To The "Butterfly Guy"!